You'll want something to wash that down with! Red-checked Spaghetti Drink Ticket tempts with a silver, pasta-wrapped fork, helping you sell more drinks, manage bar tabs in advance, and reward your loyal patrons. Choose the matching templates in the Spaghetti event kit for your next big community spaghetti feed. Keep 'em coming back for seconds. 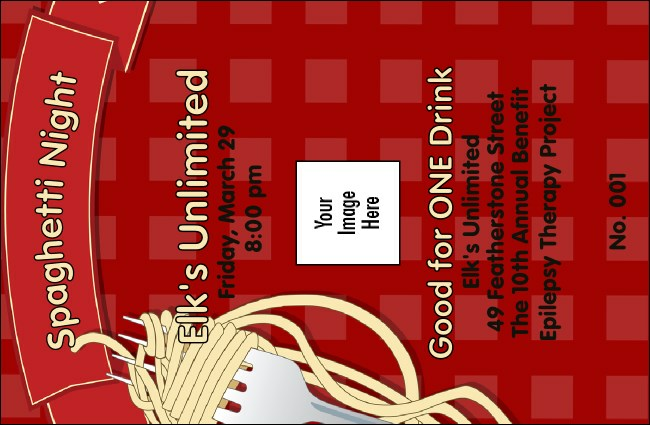 Browse the template gallery at TicketPrinting.com for a heaping helping of delicious designs.